This beautiful design is guaranteed to make you smile. 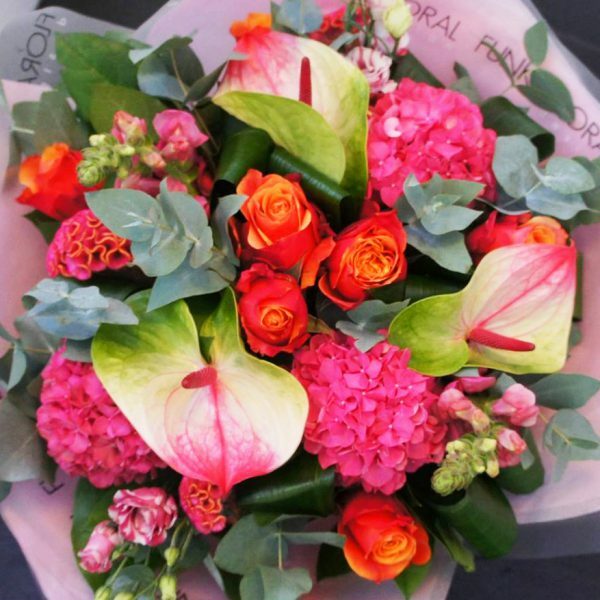 With a combination of hot pinks and bright oranges this bouquet contains Hydrangea, exotic two tone Anthuriums, unusually textured Celosia, stunning Cherry Brandy Roses, two tone pale pink Lisianthus and gorgeous Snapdragon with Eucalyptus and folded Aspidistra Leaves. Your hand made bouquet arrives with our lavishly branded Funky Floral Design packaging. We deliver Tuesday to Saturday. Please note: Due to seasonal supply appropriate flower substitutions may be made to the bouquets. We ensure any substitutions will be of equal quality, value and maintain the beautiful style of the bouquet.